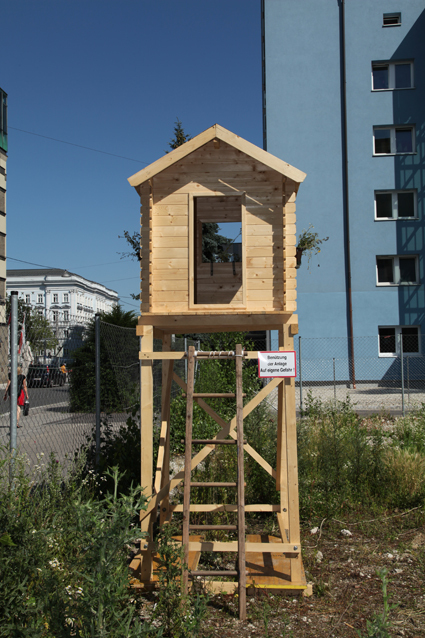 Interventions on different Places in public space, together with the artists Karla Woess, Violeta Ivanova, Madeleine Schrabauer. This installation is a reference to the personal memories of the artist of this place, which was a train station connecting the urban city to the rural countryside from 1912 until 2005, a very romantic railway called the LILO. Nowadays they build big houses on it. 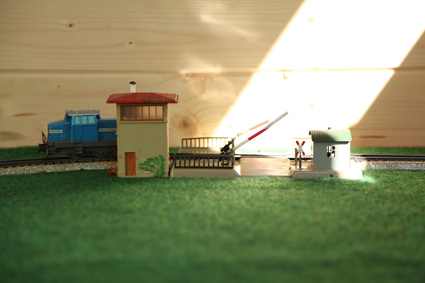 A raised hide with a little house on it, potted flowers on the side and a model railroad inside remind of the old railway station. There was also a tennis club in the area around old railway station. 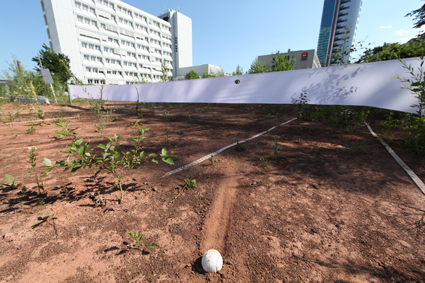 This work is a reconstructing this place by stretching a white cloth with a hole as big as a tennis ball over the still existing net posts. 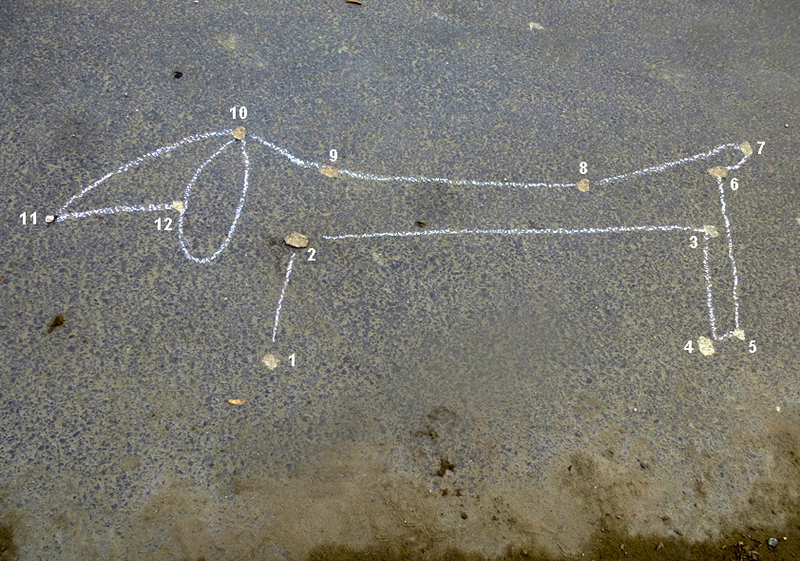 In front of it there is a white tennis ball on the ground giving the impression that it was thrown through the cloth and landed on the ground. 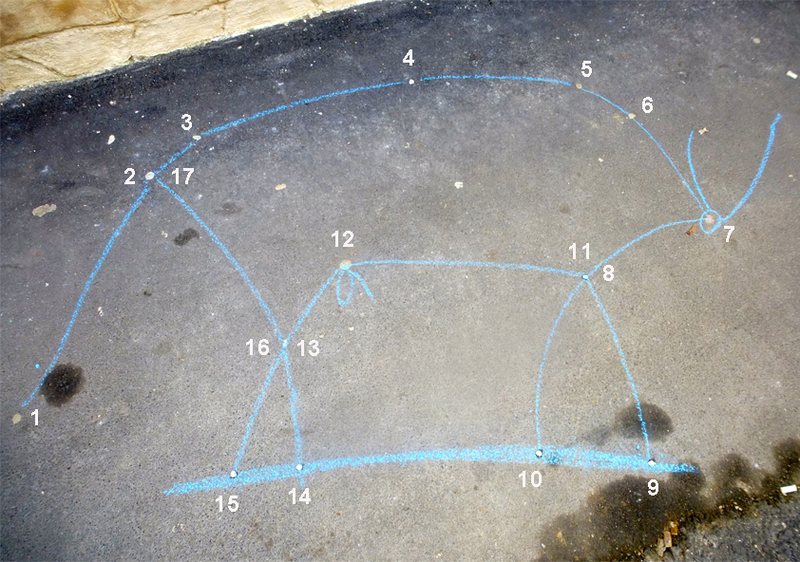 The ballistic trajectory was visualized and so the "last shot" was captured. 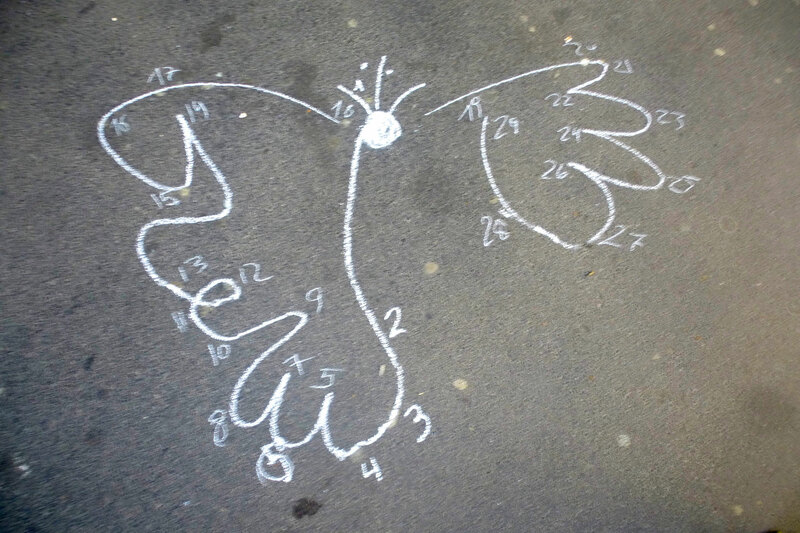 Chewing gums on the streets are marked by numbers and connected with lines, so that some of Picasso´s animal-paintings can be identified. 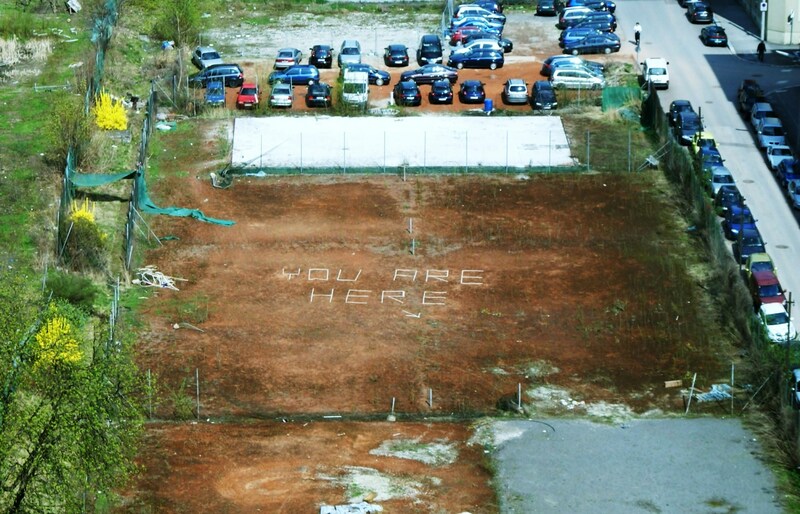 Its a word play with different meanings made with remaining court marking strips of the old tennis court. 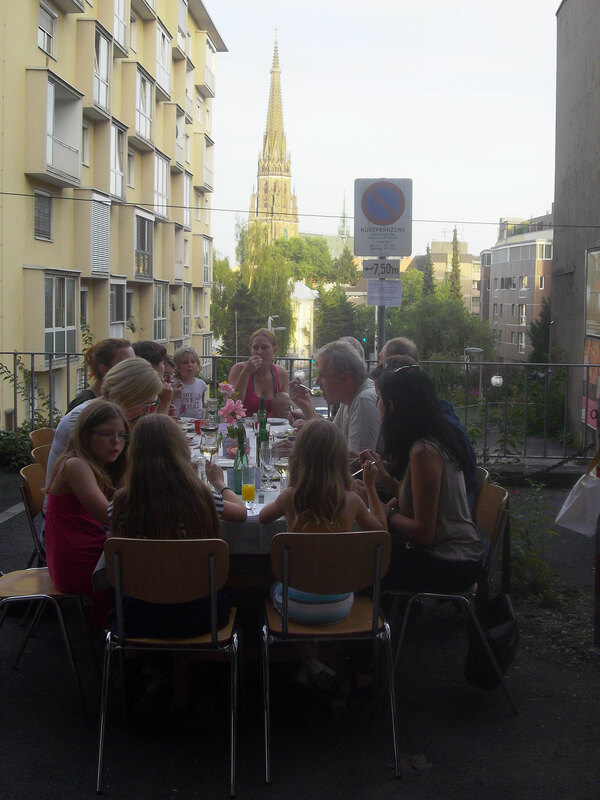 What is happening when people living in the same street are chosen randomly for a common dinner party in a parking area? 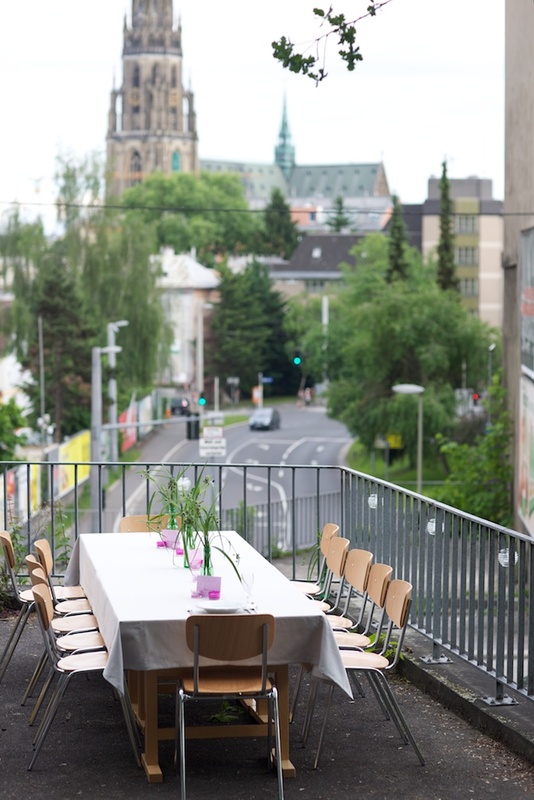 The project “Tischlein deck dich” - "The Wishing Table" took place on four evenings in June 2012 in a highly frequented street in Linz. 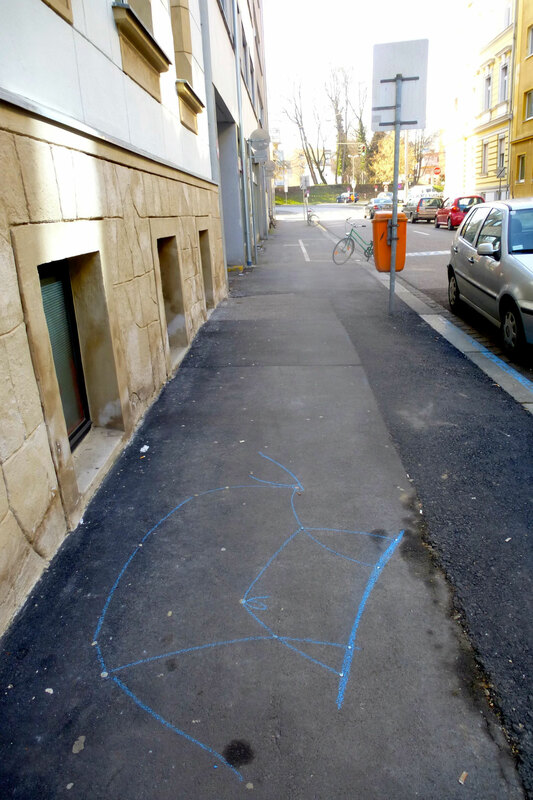 The ambition of the six artists was to provoke an interaction between the residents but also to create an intervention in public. The residents were invited for a dinner. The only requirement for the guests was to bring their own dishes and to be willing to have pictures taken. 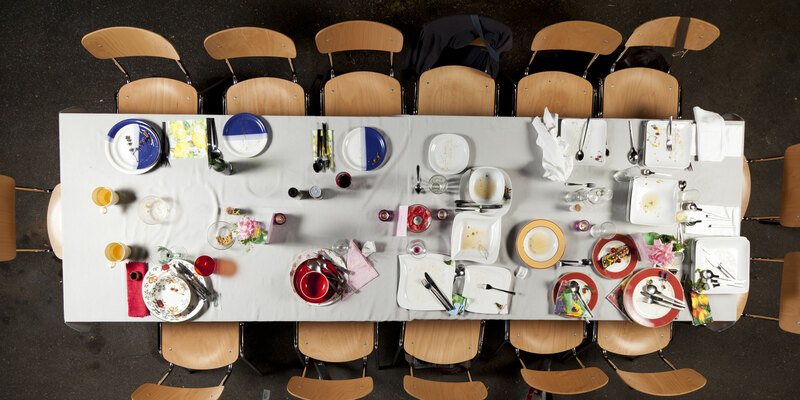 These portraits of the tables are presented chronologically in an exhibition. 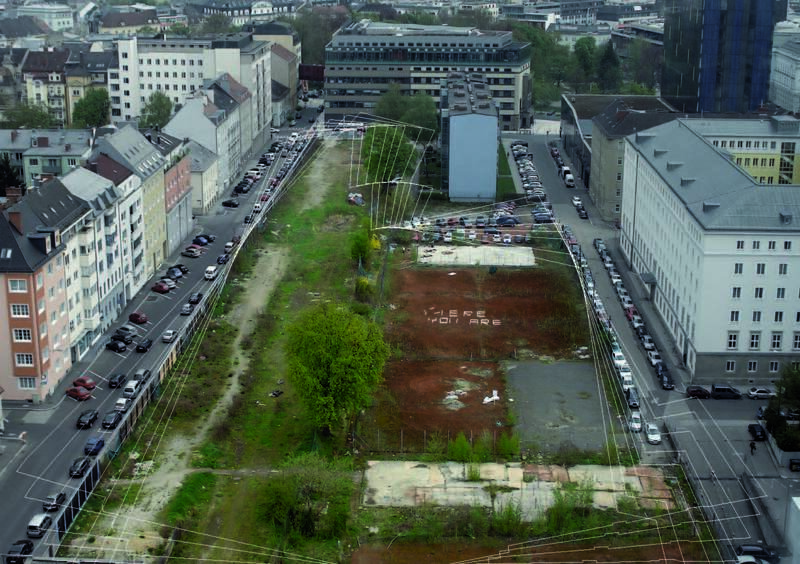 Project in the public space: Artists: Katharina Brandl, Bianca Haindl, Rebecca Paterno, Anna Petersen, Barbara Schmid & Angelika Windegger. 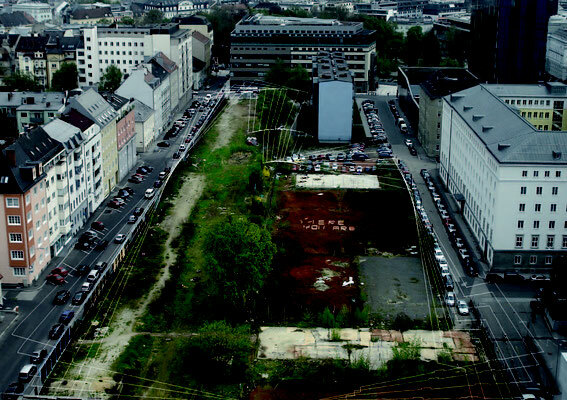 Idea: Founding a "gang" called L.U.S.T and making different interventions in the public space of Linz. Is there a difference in the contact with other people if we act as a „Gang“? What happens, if we are masked and what provokes this change of identities? 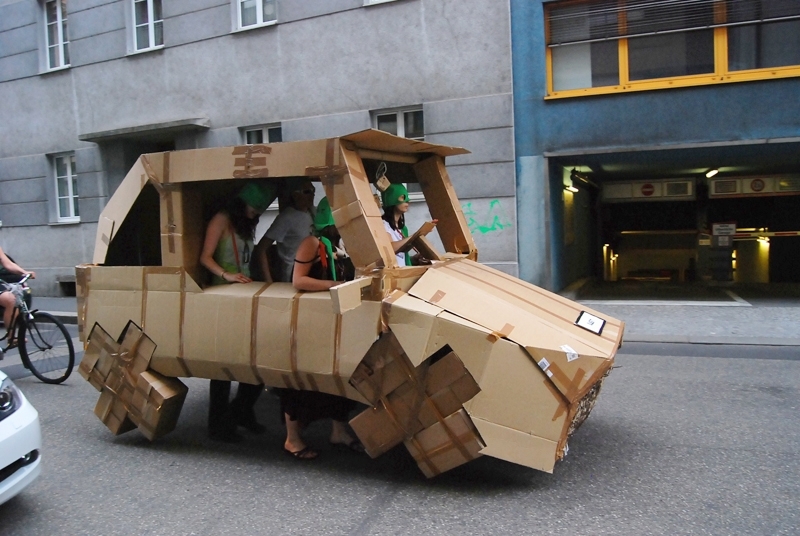 What happens if we go through the city with a car made of paper? 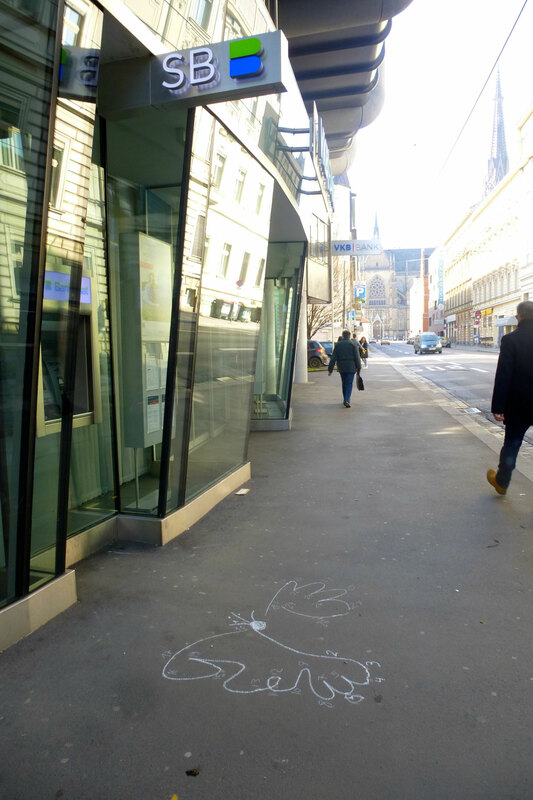 Which reactions are caused by a „green carpet“ on the main square inviting to go barefoot? 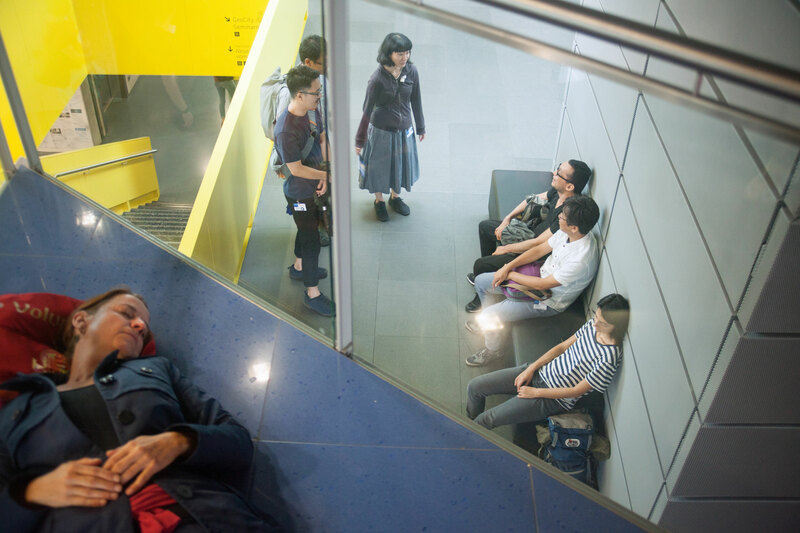 How long can we call it art and when does it turn to public anger? 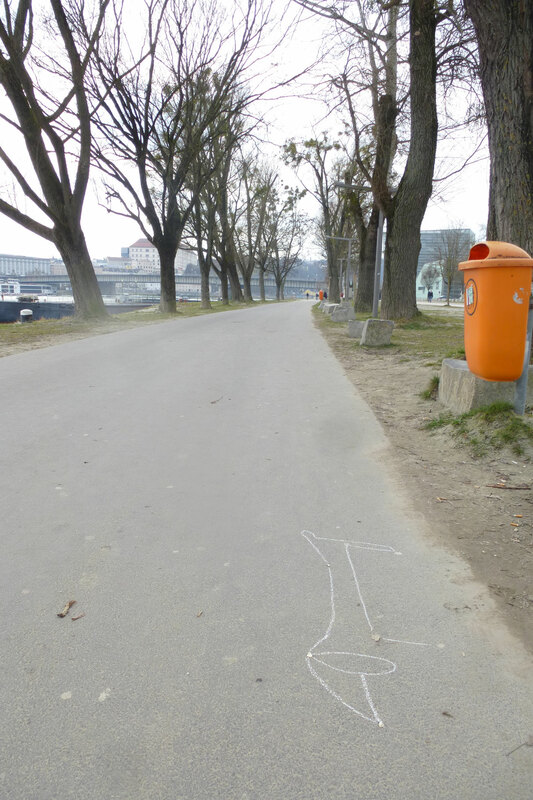 Ambition: Interventions in the daily life of people to create a contrast to the usual image of the city and to stimulate communication between the citizens.